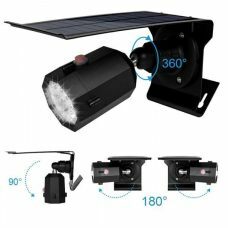 What should be known about outdoor LED solar wall lights before shopping? Solar wall lights are used progressively both in residential housing and on commercial sites such as business premises, offices, warehouses, parking and other outdoor areas. The LED Lights provides essential and comfortable work illumination without consumption of energy when it is unnecessary and extra expenses for electricity bills. 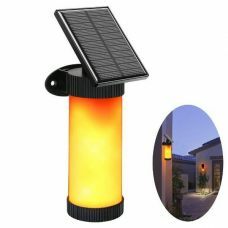 Solar lighting is more than affordable products on the market today and can be found at many households in Australia. One of the most popular types of it is outdoor solar wall lights. Usually, it is difficult to get electrical power to an outside of the house or wall, so these lights light can easily solve this problem. It can be effortlessly installed on any surface by attaching or fitting with a special mount and if it is necessary to a couple of screws. Nothing else needed. No wonder that traditional exterior wall lights that stick out from the wall on a mounting arm are a favourite type of exterior lighting. 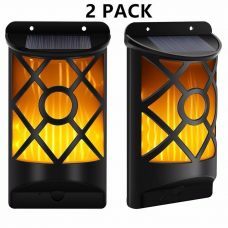 It is great for outdoor areas around a house, garden and backyard such as a porch, terrace, Balcony, BBQ areas or hallways, where regular light is not an option. Depends on the purposes using LED wall lights powered by solar can create a unique and contemporary environment or simply illuminate the areas that for a reason cannot accommodate a traditional fixture. There is only one general condition solar lights have to be placed under the direct sun to charge the battery via a solar panel. Does not sound complicated? Exactly, that is all about outdoor exterior lighting anyway. 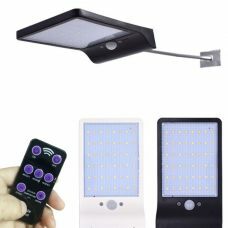 What are the advantages of using outdoor solar powered wall lights for house and garden? One of the major advantages of using solar lights outside of a house is it does not require any electrical wiring that makes them suitable for different environments and circumstances. 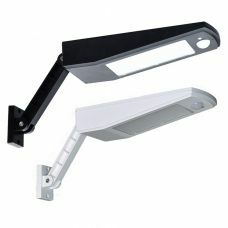 Wall mount allows attaching the LED lights into almost any surfaces whenever it may be necessary. 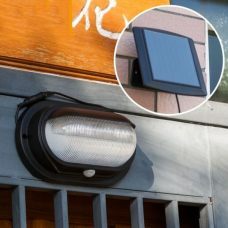 Outdoor LED solar wall lights come with a small solar panel attached on the top to absorb the sunlight during the day to harness the energy and store into the battery until nighttime. This process is fully excluded usage of electricity that makes solar power lighting independent and money saving on the utility bills. The cost of the green device will be paid off and save a significant amount of money in the long run. The other good thing about the lighting powered by the sun’s rays is that most of the products are maintenance-free and do not require to turn on and off manually. 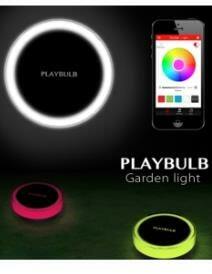 They contain an automatic light sensor that detects the daylight and controls the light switches depends on that. Are there enough varieties of LED wall lights and wall lighting products to meet different needs? 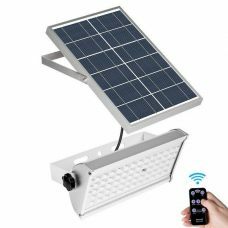 Solar powered wall lights have been improved a lot for the past years, and now there is a broad assortment of energy-efficient lighting with wall mounts available for housing and commercial purposes. 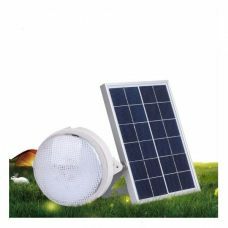 There are many diverse types, styles, and colours of outdoor solar lights available nowadays like solar wall mount lights, bright lamps and elegant lanterns, solar wall scones and many others. Some of them also come with a PIR motion and even voice sensor that significantly increases functionality and can be a perfect solution for outdoor emergency and security lighting. Besides walls, all these products can be easily attached also to a fence or any other constructions that make the lighting universal and practical. 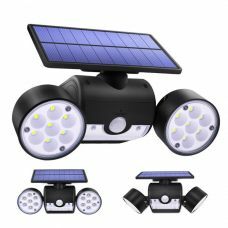 The options and areas for using solar powered lights keep expanding that providing more and more flexibility to household owners to create whatever they need. Moreover, the products are getting more reliable and sturdy and as the result do not inferior in quality of traditional electric lighting. So it does not matter what type of wall mount lights have been chosen, because each option provides not just confidentiality in outstanding quality, but also at least a feeling right decision that contributes to reducing the negative impact on the planet by using green environmentally-friendly technology while also saving money. Where to look for a broad range of outdoor solar wall lights in Australia with free delivery? 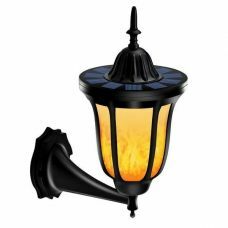 Sunny Bunny Australia offers an impressive range of traditional and contemporary solar wall lights fittings. 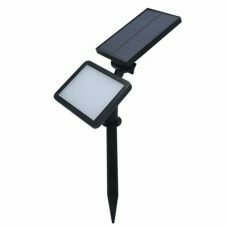 All kinds and types of Outdoor Solar Lights with wall mounts like Exterior Solar Lamps, Solar Light Fittings, and Solar Lanterns are presented in one place online. All products are available on the site with detailed description and variety of photos from different perspectives. Browse our lighting products from the page, and, if there are any questions, feel free to contact our customer service team. 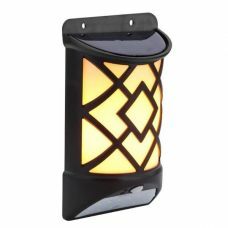 It is important for us to make sure that our customers have a lot of diverse options when they are shopping online for solar powered LED wall lights and lightings. There are plenty of additional options and features like Special Offers, Featured Products and Customer Rating for each product that will help to orientate among rich selection and find a unique LED light that matches particular place and space. 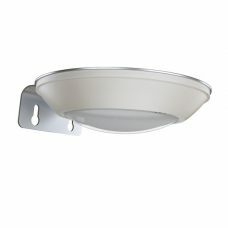 All wall mount lighting products are available in a variety of LED colours includes warm white and white and styles. Sunny Bunny Solar Power offers only high-quality solar wall lights with free delivery options all around Australia and New Zealand.